Episode ten is dedicated to talking to four women about vintage styling. It’s a new year and that means you might have set a resolution to embrace your inner vintage. But nailing a red lip, a good set and a winged liner can be hard work and needs practice and sometimes guidance. So meet Stephanie from Style by Divine! She makes people look vintage fabulous for a living! 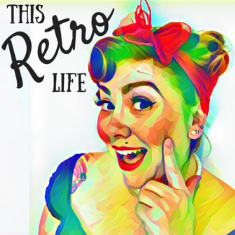 And she shared some great tips for vintage styling in the latest episode. From getting that perfect curl set and then brush out to tips for getting your winged liner on your eye and not all over your face (or is that just me). But vintage styling is so much more than having hollywood waves and a red lip. What I’ve found since starting this podcast is that being a part of the vintage community is about a feeling and attitude and family. I have been lucky enough to be embraced by that family in Port Macquarie in New South Wales. And after taking part in a vintage fashion parade run by Miss Dale Velvet Rose (who you met in episode seven!) I spoke with Miss Lulu Valentine, Miss Cherie Amour and Miss Elvina Anne about what inspires their love of vintage and what they love about being a part of the pinup community. All these beautiful women compete on the pinup circuit. With Miss Cherie Amour taking out the 2016 crown for Port Retrofest. It was incredible to get an insight into what goes into these pinup competitions and what the mood is like backstage as stockings, girdles and petticoats fly. You can meet all these beautiful women in episode 10 of This Retro Life.